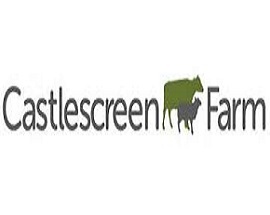 At Castlescreen Farm we raise grass fed Dexter cattle. We do whatever it takes to get the most flavour on your plate. That starts with early mornings and late nights, looking after our Dexter herd. We make sure they’re at home in some of the best pastureland Ireland has to offer, enjoying fresh grass and the free range life all year round. What we don’t do is add anything unnatural or use intensive farming methods. They may be wee cows, but they are big on taste, producing tender beef with a distinctive flavour. Dexter beef is recognised by high profile chefs for its quality, texture and taste. The Michelin starred OX Restaurant, Belfast has featured Castlescreen dexter beef on its menu this year. Our beef is all dry aged for 30-35 days, intensifying its flavour. Our gourmet burgers, sausages and beef & veg roll are rusk free. We also have a delicious gluten free range. Grass fed beef offers many health benefits: higher Omega 3 content than mackerel, rich in natural vitamins and low in saturated fats. Charlie has won senior bull champion 8 times including Balmoral show overall champion 2015.